About three years ago, someone in our social media circle made a post – a photographer had taken ill during a wedding shoot, and the wedding party and all the guests were already in the church! Could anyone cover the event? I threw my stuff together, jumped into my car, and set off on the half hour drive. Fortunately, the officiant was understanding enough to hold things up until I got there. It did feel a little strange, walking into a church full of people who were all waiting on your arrival. I briefly felt like I was simply late, as though it was my tardiness that was keeping everyone waiting. With virtually no dialog with anyone, I positioned myself if the aisle for the procession. The ceremony was photographed, and then we all went outside for some images of the bride and groom, and their bridal party. Do I have to even say it? 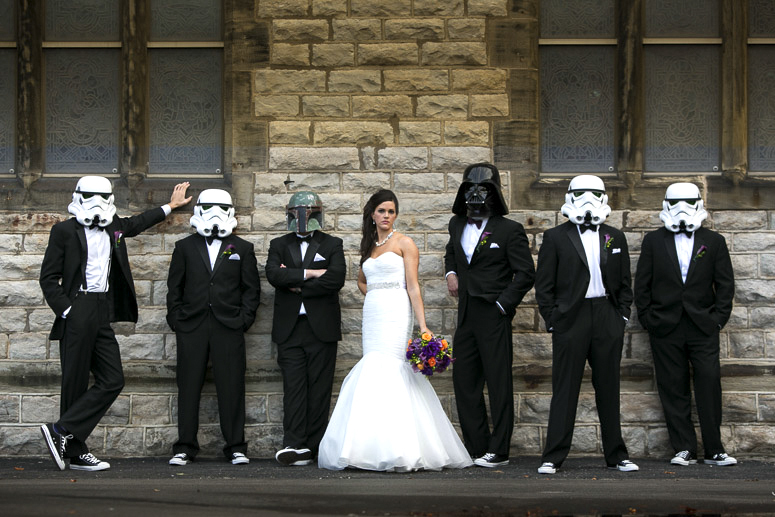 The groom was a Star Wars fan! It just seemed fitting, with the latest Star Wars release, that I pull this image out of hibernation. It’s possibly the most unusual wedding photograph I have shot. It should also be mentioned how close this came to being a disaster. When you book a photographer that is going to photograph your wedding alone, you run the risk of something like this happening. In this case, it was illness. It could have easily been a lesser illness, like the flu for example. How much on their game would a person be, shooting your wedding with a bad case of the flu? This is why a second photographer is absolutely essential. I mean a second shooter that is a professional photographer in their own right, NOT an assistant. An assistant isn’t going to cut it all day long. I second for other pro photographers, and they second for me. It’s the best policy. Be smart – only book two professional photographers. Here is some info on finding a photographer. Want to chat about wedding photography?